Gilad Atzmon: Dear friends, this may well be one of the greatest days of my life. Just a few minutes ago, I saw this piece expressing unequivocal support from Professor John J. Mearsheimer clearly one of the most distinguished scholars in our discourse and beyond. For years I have been subjected to smear campaigns . I obviously survived them all because those who read me grasped the humanist intent in my work. In the following article, professor Mearsheimer exposes the banality and crudeness of the Zionist tactics. He shows how Goldberg & Co forge sentences, take words out of context and attribute misleading meanings. I am afraid to advise my detractors that I am not alone at all. The Tide Has Changed. 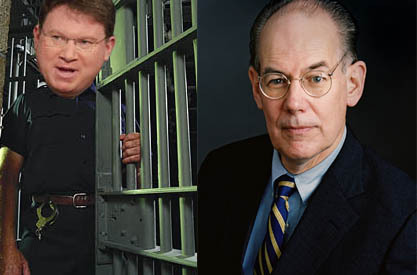 Ever since John Mearsheimer and I began writing about the Israel lobby, some of our critics have leveled various personal charges against us. These attacks rarely addressed the substance of what we wrote -- a tacit concession that both facts and logic were on our side -- but instead accused us of being anti-Semites and conspiracy theorists. They used these false charges to try to discredit and/or marginalize us, and to distract people from the important issues of U.S. Middle East policy that we had raised. The latest example of this tactic is a recent blog post from Jeffrey Goldberg, where he accused my co-author of endorsing a book by an alleged Holocaust denier and Nazi sympathizer. Goldberg has well-established record of making things up about us, and this latest episode is consistent with his usual approach. I asked Professor Mearsheimer if he wanted to respond to Goldberg's sally, and he sent the following reply. In a certain sense, it is hard not to be impressed by the energy and imagination that Jeffrey Goldberg devotes to smearing Steve Walt and me. Although he clearly disagrees with our views about U.S.-Israel relations and the role of the Israel lobby, he does not bother to engage what we actually wrote in any meaningful way. Indeed, given what he writes about us, I am not even sure he has read our book or related articles. Instead of challenging the arguments and evidence that we presented, his modus operandi is to misrepresent and distort our views, in a transparent attempt to portray us as rabid anti-Semites. Gilad Atzmon has written a fascinating and provocative book on Jewish identity in the modern world. He shows how assimilation and liberalism are making it increasingly difficult for Jews in the Diaspora to maintain a powerful sense of their 'Jewishness.' Panicked Jewish leaders, he argues, have turned to Zionism (blind loyalty to Israel) and scaremongering (the threat of another Holocaust) to keep the tribe united and distinct from the surrounding goyim. As Atzmon's own case demonstrates, this strategy is not working and is causing many Jews great anguish. The Wandering Who? should be widely read by Jews and non-Jews alike. The book, as my blurb makes clear, is an extended meditation on Jewish identity in the Diaspora and how it relates to the Holocaust, Israel, and Zionism. There is no question that the book is provocative, both in terms of its central argument and the overly hot language that Atzmon sometimes uses. But it is also filled with interesting insights that make the reader think long and hard about an important subject. Of course, I do not agree with everything that he says in the book -- what blurber does? -- but I found it thought provoking and likely to be of considerable interest to Jews and non-Jews, which is what I said in my brief comment. Goldberg maintains that Atzmon is a categorically reprehensible person, and accuses him of being a Holocaust denier and an apologist for Hitler. These are two of the most devastating charges that can be leveled against anyone. According to Goldberg, the mere fact that I blurbed Atzmon's book is decisive evidence that I share Atzmon's supposedly odious views. This indictment of me is captured in the title of Goldberg's piece: "John Mearsheimer Endorses a Hitler Apologist and Holocaust Revisionist." This charge is so ludicrous that it is hard to know where to start my response. But let me begin by noting that I have taught countless University of Chicago students over the years about the Holocaust and about Hitler's role in it. Nobody who has been in my classes would ever accuse me of being sympathetic to Holocaust deniers or making excuses for what Hitler did to European Jews. Not surprisingly, those loathsome charges have never been leveled against me until Goldberg did so last week. Equally important, Gilad Atzmon is neither a Holocaust denier nor an apologist for Hitler. Consider the following excerpt from The Wandering Who? As much as I was a sceptic youngster, I was also horrified by the Holocaust. In the 1970s Holocaust survivors were part of our social landscape. They were our neighbours, we met them in our family gatherings, in the classroom, in politics, in the corner shop. The dark numbers tattooed on their white arms never faded away. It always had a chilling effect. . . . It was actually the internalization of the meaning of the Holocaust that transformed me into a strong opponent of Israel and Jewish-ness. It is the Holocaust that eventually made me a devoted supporter of Palestinian rights, resistance and the Palestinian right of return" (pp. 185-186). It seems unequivocally clear to me from those sentences that Atzmon firmly believes that the Holocaust occurred and was a horrific tragedy. I cannot find evidence in his book or in his other writings that indicate he "traffics in Holocaust denial." The real issue for Atzmon -- and this is reflected in the excerpt from his blog post that Goldberg quotes from -- is how the Holocaust is interpreted and used by the Jewish establishment. Atzmon has three complaints. He believes that it is used to justify Israel's brutal treatment of the Palestinians and to fend off criticism of Israel. This is an argument made by many other writers, including former Knesset speaker Avraham Burg, historian Peter Novick, and political scientist Norman Finkelstein. Atzmon also rejects the claim that the Holocaust is exceptional, which is a position that other respected scholars have held. There have been other genocides in world history, after all, and this whole issue was actively debated in the negotiations that led to the building of the Holocaust Museum in Washington, DC. Whatever one thinks of Atzmon's position on this subject, it is hardly beyond the pale. Finally, Atzmon is angry about the fact that it is difficult to raise certain questions about the causes and the conduct of the Holocaust without being personally attacked. These are all defensible if controversial positions to hold, which is not to say one has to agree with any of them. But in no way is he questioning that the Holocaust happened or denying its importance. In fact, his view is clear from one of Atzmon's sentences that Goldberg quotes: "We should strip the holocaust of its Judeo-centric exceptional status and treat it as an historical chapter that belongs to a certain time and place." Note that Atzmon is talking about "the holocaust" in a way that makes it clear he has no doubts about its occurrence, and the passage from The Wandering Who? cited above makes it clear that he has no doubts about its importance or its tragic dimensions; he merely believes it should be seen in a different way. Again, one need not agree with Atzmon to recognize that Goldberg has badly misrepresented his position. There is also no evidence that I could find in The Wandering Who? to support Goldberg's claim that Atzmon is an apologist for Hitler or that he believes "Jews persecuted Hitler" and in so doing helped trigger the Holocaust. There is actually little discussion of Hitler in Atzmon's book, and the only discussion of interactions between Hitler and the Jews concerns the efforts of German Zionists to work out a modus vivendi with the Nazis. (pp. 162-165) This is why Goldberg is forced to go to one of Atzmon's blog posts to make the case that he is an apologist for Hitler. Before I examine the substance of that charge, there is an important issue that needs to be addressed directly. Goldberg's indictment of Atzmon does not rely on anything that he wrote in The Wandering Who? Indeed, Goldberg's blog post is silent on whether he has actually read the book. If he did read it, he apparently could not find any evidence to support his indictment of Atzmon. Instead, he relied exclusively on evidence culled from Atzmon's own blog postings. That is why Goldberg's assault on me steers clear of criticizing Atzmon's book, which is what I blurbed. In short, he falsely accuses me of lending support to a Holocaust denier and defender of Hitler on the basis of writings that I did not read and did not comment upon. This tactic puts me in a difficult position. I was asked to review Atzmon's book and see whether I would be willing to blurb it. This is something I do frequently, and in every case I focus on the book at hand and not on the personality of the author or their other writings. In other words, I did not read any of Atzmon's blog postings before I wrote my blurb. And just for the record, I have not met him and did not communicate with him before I was asked to review The Wandering Who? I read only the book and wrote a blurb that deals with it alone. Goldberg, however, has shifted the focus onto what Atzmon has written on his blog. I discuss a couple of examples below, but I will not defend his blog output in detail for two reasons. First, I do not know what Atzmon may have said in all of his past blog posts and other writings or in the various talks that he has given over the years. Second, what he says in those places is not relevant to what I did, which was simply to read and react to his book. Let me now turn to the specific claim that Atzmon is an "apologist for Hitler." Again, I am somewhat reluctant to do this, because this charge forces me to defend what Atzmon said in one of his blog posts. But given the prominence of the charge in Goldberg's indictment of Atzmon (and me), I cannot let it pass. Plus, I see that Walter Russell Mead, who is also fond of smearing Steve Walt and me, has put this charge up in bright lights on his own blog. Picking up on Goldberg's original post, Mead describes Atzmon's argument this way: "poor Adolf Hitler's actions against German Jews only came after US Jews called a boycott on German goods following Hitler's appointment as German Chancellor. Gosh -- if it weren't for those pushy, aggressive Jews and their annoying boycotts, the Holocaust might not have happened!" It is hard to imagine any sane person making such an argument, and Atzmon never does. Goldberg refers to a blog post that Atzmon wrote on March 25, 2010, written in response to news at the time that AIPAC had "decided to mount pressure" on President Obama. After describing what was happening with Obama, Atzmon notes that this kind of behavior is hardly unprecedented. In his words, "Jewish lobbies certainly do not hold back when it comes to pressuring states, world leaders and even superpowers." There is no question that this statement is accurate and not even all that controversial; Tom Friedman said as much in the New York Times a couple of weeks ago. In the second half of this post, Atzmon says that AIPAC's behavior reminds him of the March 1933 Jewish boycott of German goods, which preceded Hitler's decision on March 28, 1933 to boycott Jewish stores and goods. His basic point is that the Jewish boycott had negative consequences, which it did. In Atzmon's narrative -- and this is a very important theme in his book -- Jews are not simply passive victims of other people's actions. On the contrary, he believes Jews have considerable agency and their actions are not always wise. One can agree or disagree with his views about the wisdom of the Jewish boycott -- and I happen to think he's wrong about it -- but he is not arguing that the Jews were "persecuting Hitler" and that this alleged "persecution" led to the Holocaust. In fact, he says nothing about the Holocaust in his post and he certainly does not justify in any way the murder of six million Jews. Let me make one additional point about Goldberg's mining of Atzmon's blog posts. Goldberg ends his attack on me with the following quotation from a Feb. 19 blog post by Atzmon: "I believe that from [a] certain ideological perspective, Israel is actually far worse than Nazi Germany." That quotation certainly makes Atzmon look like he has lost his mind and that nothing he has written could be trusted. But Goldberg has misrepresented what Atzmon really said, which is one of his standard tactics. Specifically, he quotes only part of a sentence from Atzmon's blog post; but when you look at the entire sentence, you see that Atzmon is making a different, and far more nuanced point. The entire sentence reads: "Indeed, I believe that from [a] certain ideological perspective, Israel is actually far worse than Nazi Germany, for unlike Nazi Germany, Israel is a democracy and that implies that Israeli citizens are complicit in Israeli atrocities." This is not an argument I would make, but what Atzmon is saying is quite different from the way Goldberg portrays it. Finally, let me address the charge that Atzmon himself is an anti-Semite and a self-hating Jew. The implication of this accusation, of course, is that I must be an anti-Semite too (I can't be a self-hating Jew) because I agreed to blurb Atzmon's book. I do not believe that Atzmon is an anti-Semite, although that charge is thrown around so carelessly these days that it has regrettably lost much of its meaning. If one believes that anyone who criticizes Israel is an anti-Semite, then Atzmon clearly fits in that category. But that definition is foolish -- no country is perfect or above criticism-and not worth taking seriously. The more important and interesting issue is whether Atzmon is a self-hating Jew. Here the answer is unequivocally yes. He openly describes himself in this way and he sees himself as part of a long dissident tradition that includes famous figures such as Marx and Spinoza. What is going on here? In other words, Atzmon is a universalist who does not like the particularism that characterizes Zionism and which has a rich tradition among Jews and any number of other groups. He is the kind of person who intensely dislikes nationalism of any sort. Princeton professor Richard Falk captures this point nicely in his own blurb for the book, where he writes: "Atzmon has written an absorbing and moving account of his journey from hard-core Israeli nationalist to a de-Zionized patriot of humanity." Atzmon's basic point is that Jews often talk in universalistic terms, but many of them think and act in particularistic terms. One might say they talk like liberals but act like nationalists. Atzmon will have none of this, which is why he labels himself a self-hating Jew. He fervently believes that Jews are not the "Chosen People" and that they should not privilege their "Jewish-ness" over their other human traits. Moreover, he believes that one must choose between Athens and Jerusalem, as they "can never be blended together into a lucid and coherent worldview." (p. 86) One can argue that his perspective is dead wrong, or maintain that it is a lovely idea in principle but just not the way the real world works. But it is hardly an illegitimate or ignoble way of thinking about humanity. To take this matter a step further, Atzmon's book is really all about Jewish identity. He notes that "the disappearance of the ghetto and its maternal qualities" in the wake of the French Revolution caused "an identity crisis within the largely assimilated Jewish society." (p. 104) He believes that this crisis, about which there is an extensive literature, is still at the center of Jewish life today. In effect, Atzmon is telling the story of how he wrestled with his own identity over time and what he thinks is wrong with how most Jews self-identify today. It is in this context that he discusses what he calls the "Holocaust religion," Zionism, and Israel's treatment of the Palestinians. Again, to be perfectly clear, he has no animus toward Judaism as a religion or with individuals who are Jewish by birth. Rather, his target is the tribalism that he believes is common to most Jews, and I might add, to most other peoples as well. Atzmon focuses on Jews for the obvious reason that he is Jewish and is trying to make sense of his own identity. In sum, Goldberg's charge that Atzman is a Holocaust denier or an apologist for Hitler is baseless. Nor is Atzmon an anti-Semite. He has controversial views for sure and he sometimes employs overly provocative language. But there is no question in my mind that he has written a fascinating book that, as I said in my blurb, "should be widely read by Jews and non-Jews alike." Regarding Goldberg's insinuation that I have any sympathy for Holocaust denial and am an anti-Semite, it is just another attempt in his longstanding effort to smear Steve Walt and me.